Dietary fiber includes the portions of fruits, vegetables and grains that your body isn’t able to digest. Instead, the fiber stays in your intestines to help promote normal bowel function. If you’re a woman, you should incorporate 25 grams of fiber from foods into your daily diet until age 50, when the requirement drops to 21 grams daily. Oranges and other citrus fruits can help meet these goals. California Valencia oranges deliver 4.4 grams of fiber in a 1-cup serving of fruit sections, and Florida oranges have the same with 4.4 grams of fiber in a 1-cup serving. 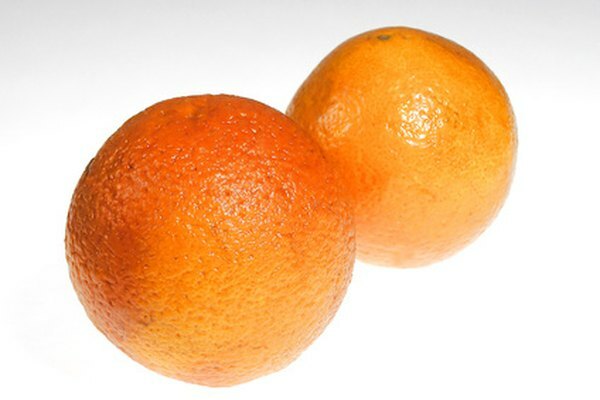 One cup of raw navel orange sections provides 3.6 grams of fiber, while the same amount of Mandarin orange segments delivers 3.5 grams of fiber. Raw orange juice has only 0.5 gram of fiber in an 8-ounces serving, while orange juice from concentrate provides 0.7 gram of fiber in the same portion size. Oranges and other citrus fruits offer plenty of vitamins, minerals and fiber in a low-calorie package. When you eat oranges, the fiber from the fruit helps slow the rate of food absorption from your gut. This slower absorption rate helps control blood glucose levels. Dietary fiber also combines with bile acids in your intestines, signaling your liver to produce more bile acid. The liver pulls cholesterol from its stores to make the bile acid and draws excess cholesterol from your blood to replace those stores. This process lowers your blood cholesterol and reduces your risk of developing coronary heart disease, heart failure, heart attack and stroke. Fiber fills you up and keeps you full longer, making it easier to maintain a healthy weight. A plain, peeled orange is a tasty, fiber-rich snack or complement to any meal. Peel and orange, separate into segments, chop the segments and scatter them over a spinach and chicken salad. Saute chopped oranges with a bit of cinnamon and use the combination as a nutritious topping for grilled pork chops or chicken breasts. Stir chopped oranges into plain yogurt, hot cereal or even a bowl of cold breakfast cereal as additional ways to add oranges to your menu plan. Although oranges are rich in fiber by themselves, you can boost your fiber intake by 1.9 grams if you add 1 ounce of walnuts, or about 14 walnut halves, to your fruit cup. Oranges go well in a high-fiber salad that also includes chopped apples, which deliver 2.6 grams of fiber in a 1-cup serving, and three small figs that bring along 3.6 grams of fiber to the salad. Don’t strip away the orange’s fiber-rich membranes. Although most people don’t eat the orange peel, a single tablespoon of the rind contains 0.6 gram of fiber. You can shave orange peel onto salads or other dishes for a tasty garnish.